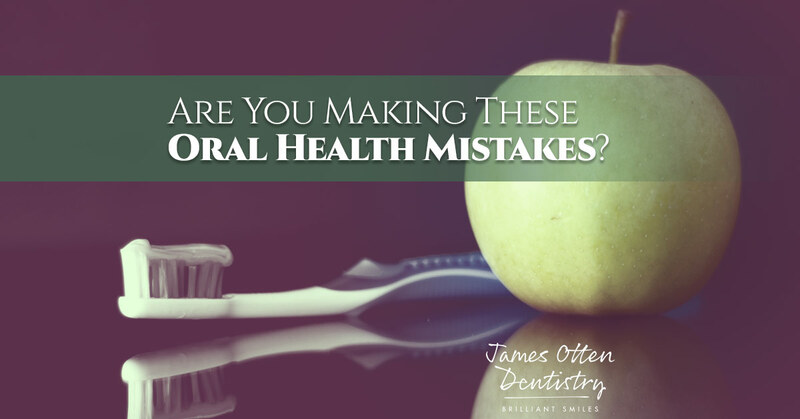 Dentist Lawrence: Are You Making These Oral Health Mistakes? Are You Making These Oral Health Mistakes? Your oral health plays a large role in your health as a whole, so it’s important to avoid common oral health mistakes. Mistake #1. You neglect your tongue when you brush your teeth. Many people religiously brush their teeth twice a day, once in the morning and once at night, and while this is definitely a positive habit to form, it’s important not to forget about your tongue. Your tongue has lots of grooves on it that provide the perfect hiding places for bacteria. This bacteria can cause bad breath and tooth decay, so don’t forget to brush your tongue when you brush your teeth. Mistake #2. You brush too aggressively. You can get your teeth cleaner, and you can do so much faster, if you brush harder, right? Wrong! Brushing too vigorously may seem like a great way to get your teeth sparkling clean, but it can erode the enamel and damage the gums. Instead of brushing hard and fast, go slow and be gentle, and brush in circles, holding the toothbrush at a 45-degree angle. Mistake #3. You don’t go to the dentist because your teeth are healthy. If you’ve enjoyed good oral health for most of your life, or you feel like your teeth are healthy at the moment, it may be tempting to skip your dental examinations every six months. But it’s important to know that problems with your teeth or oral health aren’t always obvious, especially at the first sign of them. When you come in for your semi-annual examinations, our dentist is able to catch the first signs of trouble and help you address any issues right away. Not only can dental examinations keep your teeth and mouth healthier, they can also save you money, because it’s typically much cheaper to treat dental problems before they get too serious. Mistake #4. You brush with the same toothbrush for too long. The American Dental Association recommends that you replace your toothbrush every three to four months. This is an easy rule to neglect or simply forget about, especially if you like the toothbrush you are currently using. But the downside is that bacteria can start to grow on your toothbrush over time, and if the bristles get worn out, it won’t be able to clean your teeth effectively. Keep your oral health, as well as your overall health, in check by taking proper care of your mouth and avoiding these common oral health mistakes. Contact us today to learn more.